2019 Arcanum Trojans varsity baseball team. ARCANUM – The Arcanum Baseball Team is coming off a great season in 2018 with an 18-6 overall record and 9-3 in the league and will be looking to compete for a Cross County Conference Title this season. The team has 8 seniors all of them looking to add value to the team, and those seniors are; Wade Meeks, Evan Atchley, Lane Byrne and Michael Fecker, Isaiah Hootman, Mitchell Wogomon and Trevor Fry. Wade Meeks is a 4 year starter and a lefthanded leadoff hitter and a solid centerfielder that also will see some time on the mound. Atchley is a 3 year starter who will be in the outfield and on the rubber as well. Lane Byrne will play shortstop and is a 3 year starter as well. Carver Gostomsky is a 1st baseman and pitcher, Isaiah Hootman is an outfielder, pitcher, Mitchell Wogoman is a 3rd baseman and Pitcher and Trevor Fry will play outfield. The Trojans have two juniors they are Cory Ross in centerfield and Austin Smith in the outfield. There are 6 sophomores on the squad with many of them looking to contribute. Logan Statsny will start at 3rd base, Nick Fry at 2nd base, Logan Todd will pitch a lot and also plays outfield, Brody Williams will pitch a lot as well and is a 1st baseman, Zach Ullery a shortstop, pitcher and Cameron Burke rounds at the roster in centerfield and a first baseman. Arcanum is led by long-time coach Randy Baker and assisted by Chey Kramer. “Pitching and defense should be our strengths. We have very good depth in the pitching area with a mix of seniors and sophomores .We are returning 6 starters from last year’s team that was 18-6 overall and 9-3 in league so we have a lot of experience.” Baker stated. Keys to winning will be taking advantage of their experience and depth. “Driving in runners is going to be key for us offensively. We have good team speed,” Baker said. “Our first goal is to get better every day. Winning league is always our goal and going far in the tournament, but if you focus on the first goal, the other 2 goals take care of themselves,” Baker added. Coach Baker sees National Trail, Tri-County North and Newton as some of the early favorites in the CCC but also knows that Miami East, Twin Valley South, Ansonia and Mississinawa Valley will have something to say about the race as well. “Our league has a lot of competitive team’s, so we’ll need to be ready to play every night to be in the hunt,” Baker concluded. 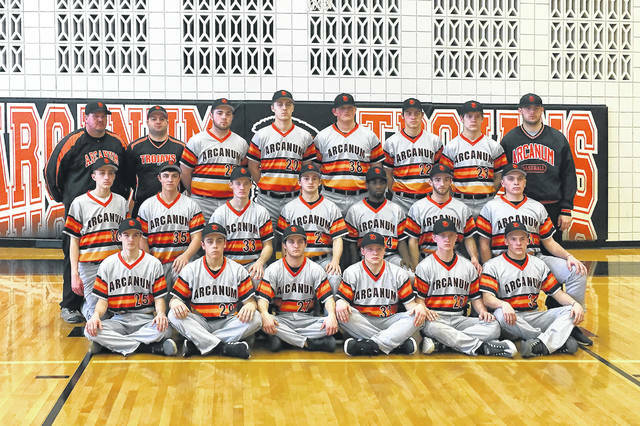 https://www.dailyadvocate.com/wp-content/uploads/sites/34/2019/03/web1_8-inches-Arcanum_Baseball_Team-2019.jpg2019 Arcanum Trojans varsity baseball team.